Munich—the capital of the Free State of Bayern (Bavaria), the most southern state of Germany—like all major German cities, was bombed flat in the mid 1940s for various reasons that I’m sure you are all aware of. With this in mind one can’t help being struck by how beautiful Munich is. Munich is a babe in the most non-gendered sense of the word (purely because I don’t know the gender of Munich yet). He/She is an elegant androgynous creature, not afraid of its past, its future or the over-use of primary colours when dressing. Topping Monocle’s World’s Most Liveable Cities Index in 2007 and 2010, Munich blends culture, lifestyle and green spaces to make a city with an exciting, chic and surprisingly relaxed vibe. 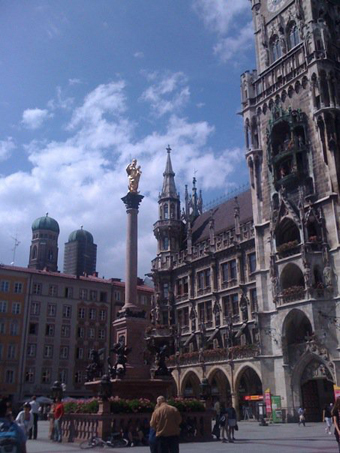 Munich is the major cultural centre of the southern half of Germany, so although its population is only a little over a million it punches well above its weight when it comes to the arts. The annual dance symposium TANZWERKSTATT Europa concluded on my arrival culminating in a massive dance piece created out of all the workshops and classes that made up the festival. When it comes to theatre, the Munich Kammerspiele is unsurpassable. Premiering a mix of new writing and warped renditions of modern and ancient classics it is arguably the best large theatre in Germany outside Berlin and is celebrating its centenary this year. Make a beeline for its doors when in town. 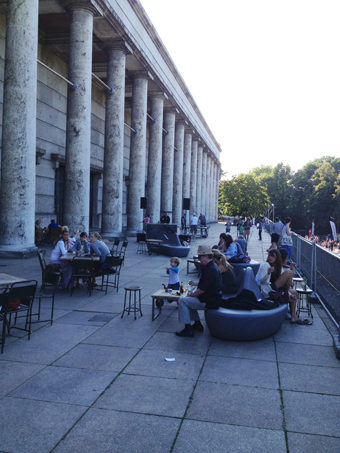 As for galleries one cannot ignore the brilliant Haus der Kunst, a neo-classical pile commissioned by Adolf Hitler to be home to the masterpieces of the Third Reich. Keenly aware of its past, it is now the centre of political and socially aware art, film and conversation in Munich. It also has an excellent bar and several high-end night clubs buried in its flanks. The indie scene is dominated by two venues on opposite sides of the city. In the north, Schwere Reiter features all the performance art, movement and agit-prop wonderment you can handle. And in the south is the urbane and weird i-camp—a lovely theatre space, housing theatre, dance, touring companies and anything else that takes their fancy. Last winter they decided to open up the large barn doors at the rear of the theatre, letting in the bitter cold, turning the stage into a natural ice rink. All shows for that month were then staged on ice skates or sleds regardless of the content or context. It’s that kind of place. 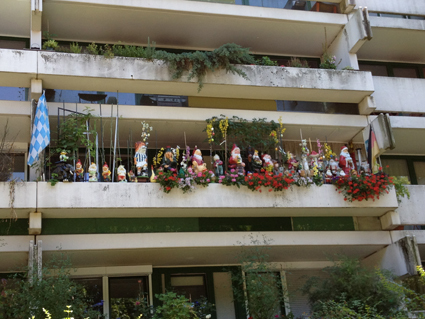 Munich wouldn’t be Munich without its beer garden culture. Beer gardens are almost impossible to avoid so my recommendation is to embrace them with all your heart. My favourites are buried in the thickly wooded eastern bank of the Isar River, such as the trendy Muffat Halle Beergarden complete with its own adjoining nightclub and live music venue. A short walk through the trees will then deliver you to the Hofbraukeller beer garden. Surrounded by pretty chestnut trees it will supply you with all your kitsch thigh slapping needs as well as excellent food and cocktails for those who aren’t into taking their beer by the litre. Once the gardens close for the night the best option is the ridiculously huge KultFabrik, a vast 25-club complex, open all hours. Take the U-bahn and run wild. If staying in a hotel (albeit a cheap one) is an option for you, I can highly recommend the hotels of the new chain Motel One. Usually with good locations, They're well priced, very clean and offer great breakfast options. Good for large groups if you’re planning a tour of Germany any time soon. what’s a dramatist to do?